The Bone Spring play continues to compete with other headline unconventional plays across the Lower 48 in daily output, producing about 460,000 boe/d (6:1) for much of 2017. Compared with other major oil plays, such as the Eagle Ford and Wolfcamp Delaware, the Bone Spring ranked first in productivity from January 2016 to July 2017, averaging around 170 boe/d per 1,000 lateral ft (20:1). Although most Bone Spring operators have settled on relatively short laterals of around 4,000-5,000 ft play, some operators have found success in longer laterals—notably, Concho and EOG. A significant step change in completion size took place around mid-2016, when operators began ramping up proppant loads from 1,500 lb/ft to around 2,000 lb/ft; EOG has been the most aggressive, achieving strong results. Other operators do continue to find success using around 1,500-2,000 lb/ft of proppant in recent wells—most notably, Occidental and Mewbourne. Activity in the Bone Spring has waned since its peak in 2014; however, encouraging economics hint that a rebound in activity across the play is near, as operators continue to delineate the play while they focus on developing the deeper Wolfcamp Formation. The Permian Basin formed as a foreland basin during the Oachita-Marathon Orogeny, which was later divided into two main subbasins: the steeply dipping Delaware Basin to the west and the shallow-dipping Midland Basin to the east. The Delaware Basin has several stacked plays, particularly within the Permian-age part of the stratigraphic section, where the Bone Spring Sands are situated. The sandy formations of the Delaware Mountain Group above the Bone Spring contain hydrocarbon reservoirs, as well as the underlying Wolfcamp Formation, a prolific horizontal play. The Bone Spring play has historically been subdivided into three informal sand units: the First, Second, and Third Bone Spring Sands. Each sand is overlaid by a carbonate-rich interval. The Avalon Shale play has been an emerging target in recent years, and is situated above the First Bone Spring Sand and underneath the Bone Spring Lime. The Avalon Shale is subdivided into the Upper Avalon Shale and Lower Avalon Shale. The Bone Spring Formation reaches a maximum gross thickness of 3,400 ft. in Loving County, and is found at depths of 8,000–11,000 ft. Thickness of the individual sands varies from 180–500 ft. Both the Upper and Lower Avalon Shale members are generally 100-200 ft in thickness, reaching a maximum thickness of approximately 250-280 ft in eastern Eddy and Loving counties. Occidental, EOG, and Devon have been the most active operators in the Bone Spring in 2017, spudding nearly 70 new wells combined between May and November 2017. Despite having spud 10 new wells, Concho has only 8 permits filed in the same timeframe, indicating that it is focused more on its Wolfcamp operations in both the Delaware and Midland basins. Following ExxonMobil’s sizable acquisition of BOPCO earlier this year, it has demonstrated its determination to start developing the Bone Spring, filing permits for nearly 40 new well locations between May and November 2017. Activity in the Bone Spring waned considerably from 2015 through year-end 2016, with production hovering around 430,000 boe/d (6:1) through early 2017 (see figure 3). Despite reaching a production plateau in recent years, the play is poised for growth in early 2018. 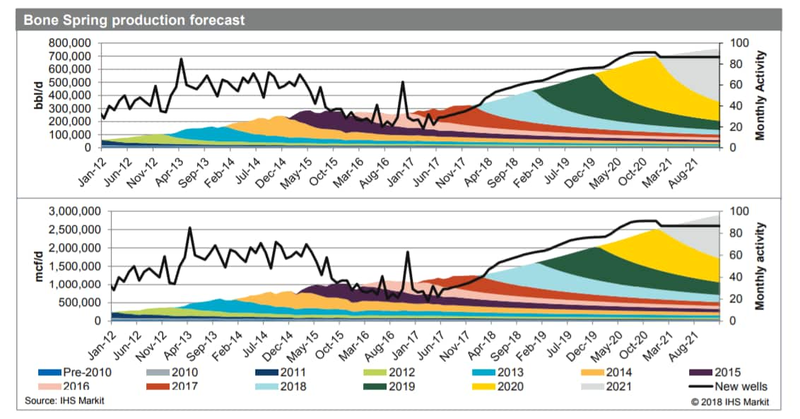 IHS Markit predicts production will continue to climb, reaching up to 1.25 MMboe (6:1) by 2021, as operators begin to ramp up activity in the play and optimize development of its prolific stacked pay zones. Learn more about our coverage of plays & basins around the globe through basin insights. Lauren Droege is a Senior Analyst and Geologist supporting the North America Onshore team in the greater Commercial Plays and Basins group.